This chapter is included in the Tools to tackle big data problems E-Book. Because big data can scale to petabytes of capacity, organizations are looking to manage it in ways that are easier and less expensive than traditional scale-out NAS. 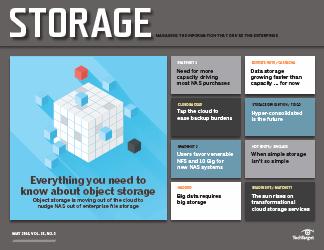 Object storage and software-defined storage are frequently mentioned as big data tools. Both can add intelligence required for analyzing data and take advantage of low-cost disk storage. An object storage system handles files differently than a traditional file system. Servers use unique identifiers to find objects, which use metadata in a far more detailed way than file systems do. The unique identifiers mean objects can be geographically dispersed because they can be retrieved without the storage system knowing their physical location. That makes objects a good choice for large data stores or data stored in a cloud. Software-defined storage has many forms and use cases, but it applies to big data when used to pool and manage data across off-the-shelf commodity hardware. Because the management and analytics happen in software appliances, the hardware can be cheap, deep disk without bells and whistles. 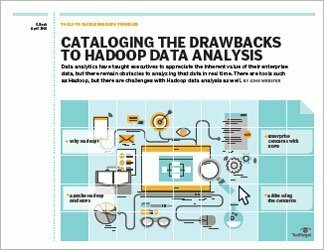 Perhaps the most well known option available is the Apache Hadoop Distributed File System (HDFS), which is a Java-based file system designed to be used in Hadoop clusters. HDFS currently scales to 200 petabytes and can support single Hadoop clusters of 4,000 nodes. It offers storage performance on a large scale and at a low cost, which is atypical of most enterprise arrays that cannot perform all three tasks simultaneously. 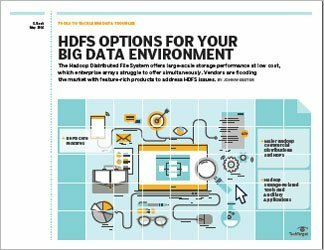 In this chapter of "Tools to Tackle Big Data Troubles," we look at some core HDFS features, three HDFS commercial distributions and other Hadoop storage-related tools and their related applications.